One visit to Collier West and it becomes obvious that the store’s proprietor, Suzi West, has an eye for unique home objets. 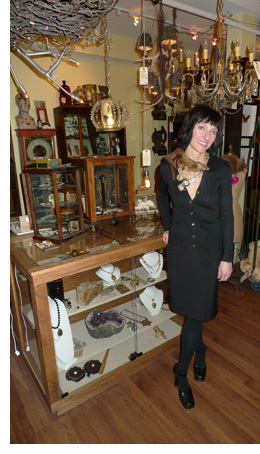 But it’s Columbus’ fashion flock that stands to benefit from her latest creative endeavor: a vintage jewelry line. Founded in October, Pont Neuf currently features about 30 pieces, a third of which are original, created designs; the balance is curated goods. “The oldest standing bridge in Paris is the Pont Neuf, which translates to ‘New Bridge.’ I have crossed that bridge many times, as I love what lies adjacent to it. It represents a beginning for me, as I find myself yet again taking a new journey,” West says. Her reasons for starting a vintage jewelry line are simple. Pieces hail from disparate eras −from the romantic Victorian period to the opulent ‘80s− and include necklaces, bracelets, rings, and cufflinks. “The created pieces are the ones I design, often mixing patinas, findings and details from several decades,” she says. This season, she showcased vintage fur stoles alongside the more ornate pieces in an attempt to present a look that emulates the glamour of the ‘30s and ‘40s. For the time being, the line is available exclusively at Collier West, located at 787 N. High St., but West is in talks with another “Columbus retailer and a high-end boutique in Cincinnati” about carrying it in the spring. Stackable bracelets from a bazaar in India are $12 each, making them the least expensive Pont Neuf accessories. They “look great as singles or in a mass on the wrist,” West says. The line’s priciest piece, loosely titled “tangled confusion part deux,” is an asymmetrical necklace fashioned from a bounty of gold chains and links. “Definitely a drama piece, yet it still retails for under $400,” she says. 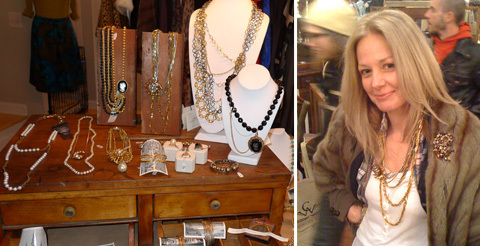 Pont Neuf’s bijoux are gleaned from flea markets, antique purveyors and, occasionally, a friend’s grandmother’s attic. Curation generally requires lots of patience and liquid hand soap, according to West. Ultimately, West takes the work out of the search process for the consumer. For the created pieces, most of the magic happens in the studio. “I may work with six to 10 other findings to get just the right look for the new design,” she says. Apparently, West’s passion for vintage jewelry is genetic. In what is surely an exciting development for any accessories newcomer, West has been asked to assemble 60 pieces by June for a potential showing to Fred Segal and a few other West Coast retailers. In fact, no one seems more surprised by West’s success than West herself.